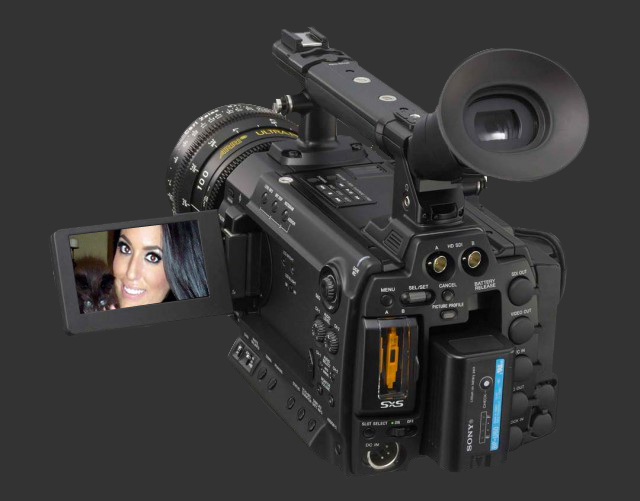 Sony’s new PMW-F3 is Sony’s third 35mm Cinealta Digital Camcorder and is based on the XDCAM EX platform. Specs of the F35 and SRW-9000PL still exceed the F3, we’re told, but this camera is no slouch, and footage shot with all 3 cameras should intercut. The F3, above all, is still a handheld camcorder. It doesn’t sit on your shoulder. It weighs about 5 pounds, which is lighter than many of the lenses you’ll be using. There’s a tilting viewfinder at the rear of the top handle. It looks similar to the HVR-Z7U finder: about 1.2 million pixels. An LCD monitor pivots out from the camera left side. 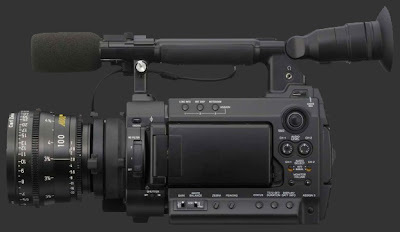 The new F3 camcorder is based on Sony’s XDCAM EX technology. There are 2 Sony’s SxS ExpressCard slots in back. The Super 35mm CMOS imager promises high sensitivity and low noise levels. The ballpark sensitivity rating is approximately ISO 800 and unconfirmed reports hint at an exposure range greater than 13 stops. There are HD-SDI dual-link outputs at the rear of the F3 for external recording (4:2:2 1080 50/59.94P normal; and RGB 1080 23.98/25/29.97PsF as an option). You’ll be able to select S-Log and Hyper Gamma to seriously increase the dynamic range. S-Log is Sony’s take on RAW “Digital Negatives.” The image, uncorrected, looks pale and washed out (like a negative), but when a Look-Up Table (LUT) is applied, shows the full dynamic range of the image, giving you greater flexibility for color and contrast correction in post. The F3 records natively onto SxS Cards at 35 Mbps at 4:2:0 8-bit in XDCAM EX format. The SxS Cards are formatted in standard FAT file format; a 32 GB Card will record 100 minutes in highest quality. Many users will be happy with this. But, like Oliver Twist, many will want more. And they can have more–with the ability to use the onboard SxS Cards as immediately editable proxies, while simultaneously recording to a higher standard. That might include 4:4:4 10-bit S-Log HD-SDI dual link to an SRW-1 /SRPC-1 SRW tape recorder at visually lossless 440 and 880 Mbps or (next year) 1 TB Solid State Memory Cards at 220 and 440 Mbps. Recording formats include 1920 x 1080, 1440 x 1080, and 1280 x 720 at 23.98/25/29.97p, 50/59.94i and, in DVCAM mode, 25/29.97PsF and 50/59.94i. Under- and overcranking is called S & Q for “slow” and “quick” recording, from 1 to 30 fps at 1920 x 1080 (17 to 30 fps in dual-link mode) and 1 to 60 fps at 1280 x 720 (17 to 60 fps in dual-link mode). Who’s going to shoot with Sony’s F3–and how? If you’re a student or independent, you’ll probably take the simplest package possible: a zoom or primes, record to SxS onboard cards, and go direct to edit. Of course, you’ll be sure to diligently back up those SxS cards using Sony’s PXU-MS240 Mobile Storage Device, which not only backs up the cards, but also carefully checks the data to be sure it’s all there (parity). Next, you’ll copy the SxS card onto your Avid or Final Cut Pro system. 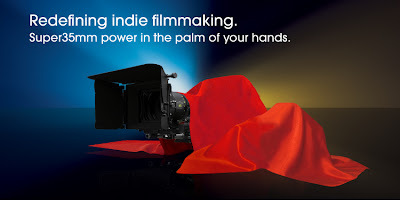 Go to www.sony.com/cinemon to download the Sony Cinemon plug-in: it enables MPEG-4 to be transparent to FCP Quicktime. You’ll be able to edit natively in FCP, with drag and drop, and all files instantly viewable on a Mac. Avid’s AMA (Avid Media Access) plug-in mounts the XDCAM EX files directly into Avid Media Composer. If you’re shooting documentaries, commercials or TV, you might follow a similar path. Of course, you will not reformat your SxS Cards until the job is safely completed and many archives and copies have been cloned. Cards are relatively cheap. The dreaded word “Oops” is very expensive when a once-in-a-lifetime scene is re-formatted. High end productions, recording to SR tape or memory, should soon have native support of SR codec on Avid and Final Cut Pro. The HD-SDI outputs of the Sony F3 will be eyed with great interest by the high-end after-market storage gurus at Codex, Cinedeck and elsewhere. At the rear of the camera: 12 VDC 4-pin XLR, dual SxS Card slots, HD-SDI dual link Out, HDMI Out, Composite Video Out, 2x USB ports, 700 Remote Control Port, and 3D Link. 3D Link is a future option that connects 2 F3 cameras in sync for stereo shooting. When connected, both cameras can be managed by one remote control. Genlock in and Timecode out are handled, along with Metadata. You’ll be able to record the left and right cameras onto one memory card, if you like. 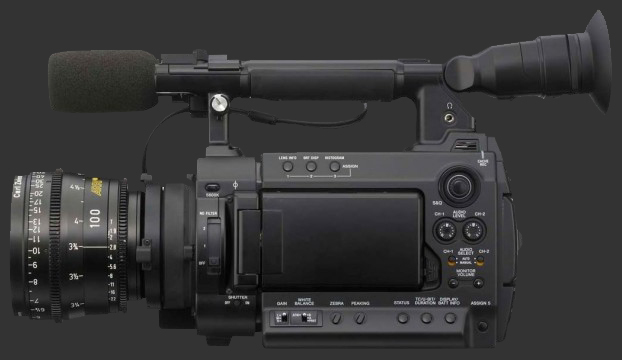 The right side of the camera has a familiar Sony camcorder handgrip with zoom rocker control–a clear indication of commitment to an upcoming zoom lens specific to the F3. There are two 3-pin XLR audio connectors (Line/Mic/+48v). On November 17, the FILMCASTLive! team will participate in a full hands-on demonstration presented by Sony and after that presentation, we will give you an assessment again, that it is not from a brochure or a press release.